Seems like weekends get the best of me and I remember to take a picture but not to post! Last night my MOL (shout out to BARB who actually reads this blog), FOL and my Aunt and Uncle in law (is that even what they are called?) came to our house for dinner. Since Mark is working like crazy I told him I would prepare dinner. I didn’t want to try anything that I was uncomfortable with so I went with one of Mark’s favorite things, BACON WRAPPED CHICKEN! Preheat over to 350 degrees. Cut peppers (you need about 3 slivers per chicken). Cut onion (we LOVE onion so I unusually load it with big chucks). Cut cheese (1-2 slices per chicken depending on size). Butterfly Chicken Breast. 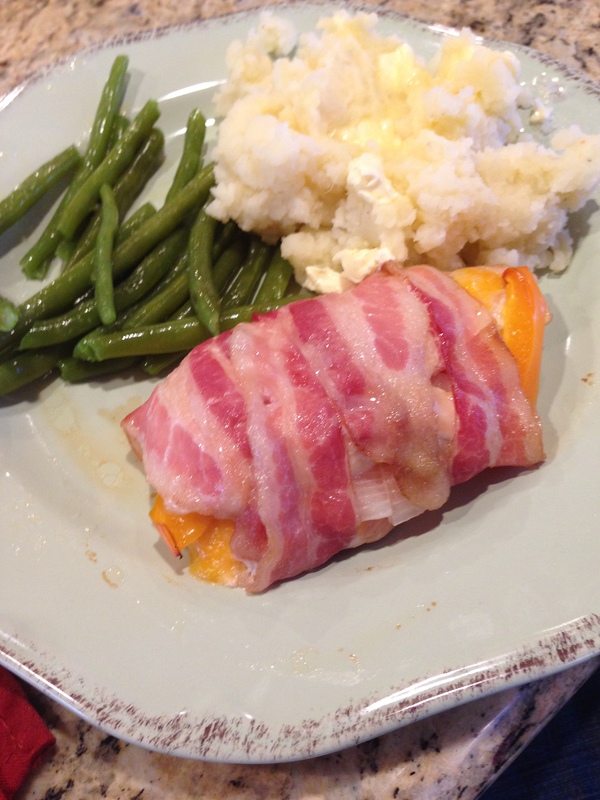 Open the breast and load with peppers, onions and cheese. Fold over. 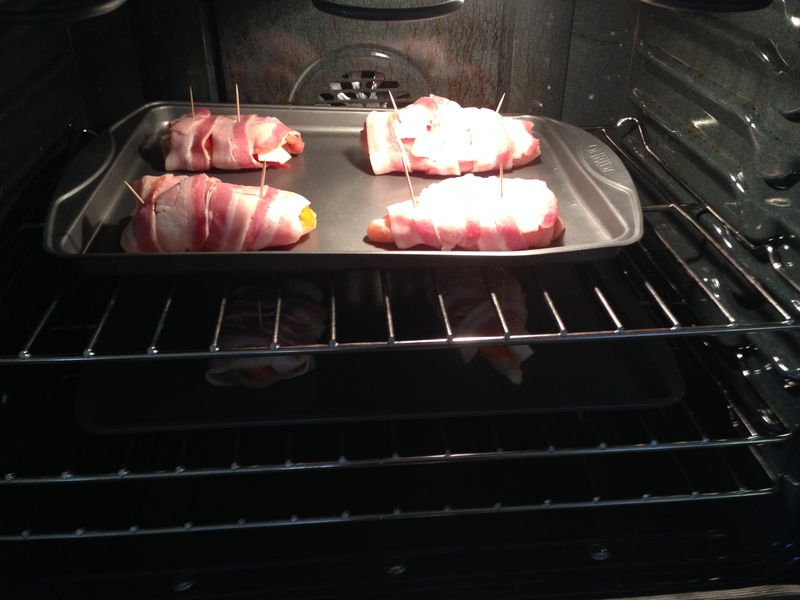 Begin to wrap bacon around the chicken and hold in place with toothpick. It typically takes me 2-3 slices of bacon depending on how large the breast is! Once wrapped place on baking sheet. Once you have all the breast completed place in oven for 30-40 mins. I paired this chicken with green beans and mashed potatoes! SO YUMMY! Of course I made the dessert I talked about in a TASTY TREATS blog post. The food was a hit and everyone left with full bellies! I was even better than it looks in the picture!! !